2018 was the year of the consumer. Unfortunately that also means it was the year of more debt and that might have left your credit score in the gutter. Qualifying for the best interest rates when you apply for a loan in 2019, maybe even without a co-signer, will mean you'll need to rebuild your score. If you plan on applying for credit soon, or even applying for a job that requires a credit check, your score needs to be as high as possible. 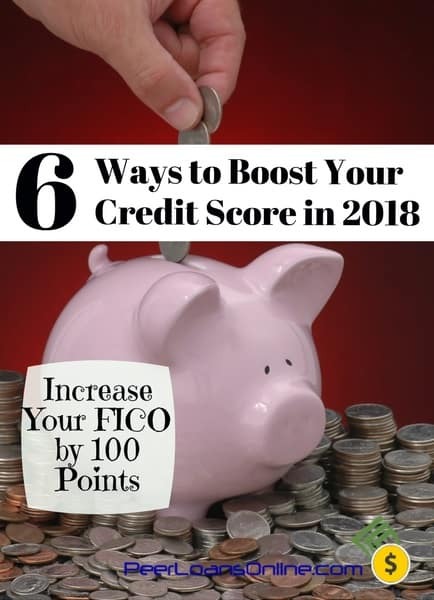 Fortunately, if you know what makes up your FICO score, you can start to use the system in your favor to boost your score. Each payment and credit request you make, usually impacts at least one of the factors above. In addition to making a budget and setting bill pay reminders, the following healthy financial behaviors can boost your score by 100 or more points by this time in 2019! If you do nothing else, pay your credit card balance in full and on-time every single month. Every missed payment affects the payment history and credit utilization of your credit score; those are the two most significant credit score factors if you’re counting. Credit card debt is not only one of the most expensive forms of debt with an average interest rate of 21%, but unpaid balances also take a toll on your credit score. That's because credit is a type of debt called revolving credit. It doesn't have a fixed payment or payoff date – and the credit scoring people don't like that uncertainty. A single missed payment can drop your score 100 points, and the missed payment remains on your record for the next seven years. It's a lot easier to ruin your credit than to increase your score. If you currently have at least one credit card with a past due balance; you need to repay that balance as soon as possible and make all future payments on-time. You might also try getting a debt consolidation loan to pay off your credit card balance. This will not only save you money in interest but will turn your revolving credit into non-revolving credit, the type with a fixed payment and payoff date. That alone will boost your credit score and the extra money from saved interest can help pay off your loan faster. To ensure you don’t struggle to afford your future credit payments, only charge your necessary monthly expenses to your credit cards like gas, groceries, and your cell phone bill. Use cash or debit to pay all non-essential expenses and use your extra monthly income to repay your existing balance. If you already have some debt that has been “charged off” and other debt that hasn’t been yet, focus on the debt that hasn’t been charged off or placed in collections status yet. If this debt is charged off, your credit score will be penalized again, potentially up to 120 points. Even though the debt snowball method says to pay the most expensive debt first, some forms of debt are still more valuable to payoff, even if they have the same interest rate. Credit cards are one of the only “free” ways to build your credit score, when used responsibly. I use a cash back credit card that pays 2% cash back and doesn’t charge an annual fee. Each month, I pay my balance in full and can watch my score rise. While on-time payments are a great start, you need to pay attention to your credit utilization ratio. That is, how much of your available credit do you use each month. Ideally, aim to only use 30% of your total credit limit for each credit card. My personal credit card has a $10,000 credit limit. If I follow the 30% rule, I can spend up to $3,000 a month before I need to worry about my score being penalized. If I was to constantly spend close to $10,000 a month, lenders might think I mishandle my money and will be afraid to lend additional money because I might not be able to afford another monthly payment. If your current credit limit is too low, ask your credit card company to increase your credit without running a credit check. I have called my bank before and found out I was pre-approved for an automatic credit limit increase with my verbal permission! I said yes, and my credit utilization ratio instantly dropped even though I didn’t spend a penny less each month. If credit card debt is what damaged your credit score, you might be tempted to cancel your credit card once you repay the balance. Don’t cancel those cards! Even though your length of credit history is only 10% of your score, the average person with excellent credit (800+) owns their credit card for at least ten years. Canceling a credit card will drop your credit score a few points before it rebounds. Even though I haven’t used the card on a regular basis in almost three years, I keep one card in a desk drawer because I’ve owned it for more than ten years. If I were to cancel this card, my credit history length would drop from 6 years to 4 years. Unless your unused credit cards charge an annual fee or you can’t resist the temptation to spend, even when it’s hidden from sight, keeping your credit cards accounts won’t harm your credit score. And, if you cancel your card and apply for a new one in a few months, your credit score will be penalized again because your credit history length is shortened and you also have a new credit inquiry; this is another credit score double-whammy you need to avoid. Although the chance of having a credit report error is small, they happen more often than you think. Visit annualcreditreport.com to pull your credit report from all three bureaus; you can do it for free once a year. If you spot any errors like improperly reported payments or fraudulent accounts, you will need to file a credit dispute with the bureau to correct the error. Once the error is corrected, your score will rise. To ensure you don’t encounter any credit reporting errors, I recommend using a credit monitoring service to have real-time access to your credit score and report. Being able to see your credit score on-demand can also be extra motivation to improve your score as quickly as possible. I use TransUnion because it's one of the three credit bureaus and they have a great reputation for customer service. The company usually offers a $1 trial offer to check out their service with no strings attached. Some people think that applying for a new loan or credit card will improve your score. In time, your credit score will increase after you establish a responsible payment history and a diversified credit portfolio, but that can take at least six months. Instead, save up cash for large purchases and do your best to not apply for new credit until your credit score is in the 700+ range. Ideally, you will have enough cash saved up so you won’t have to apply for a loan and your credit score can continue to grow. The one exception to this tip is a secured credit card. If your credit score is below 600, you will have a hard time qualifying for any loan with a decent interest rate. By having a credit limit equal to your security deposit ($1,000 or less in most cases), it’s harder to overspend, and each timely payment will improve your credit. While it can take decades to achieve a perfect credit score, it only takes a couple of years to earn excellent credit. Stay focused on making good money decisions and following these tips to increase your credit score in 2019 and you'll unlock a whole new world of financial flexibility.